if you’ve been a frequenter of my blog for a while now you’re aware of the fact that i have a very heavy heart for the upper class*. while they may not have material needs, they still have spiritual needs that are much less likely to be addressed than those of the lower class. what need do they see for Jesus amidst their lucrative lifestyle? i understand the need for service and love toward the poor and needy, but in terms of evangelism i think it’s the upper class that’s needy/farther from Jesus. i have two goals then. to serve those in need and to point upper class hearts toward Christ. step 1: live downtown and develop relationships with that community and the ministries aimed there. step 2: take the students at hillcrest down to those ministries with two purposes: to serve those in need and to install a love for service in the hearts of upper-middle class kids. step 3: invite students to bring their parents, hopefully installing the same desire to serve in their hearts. step 4: encourage students and parents to take the message and attitude they’ve brought to service events back to their schools and offices, respectively. step 5: repeat until death and look for opportunities to improve/extend the steps. both goals are fulfilled and everyone’s happy and Christ-like. obviously step-by-step processes aren’t the most effective thing on earth, relationships and timing are crucial to every step. and at any moment it may be necessary to jump backward and review a previous step before proceeding to the next. but this is what is on my heart today. please comment. * – more on this. 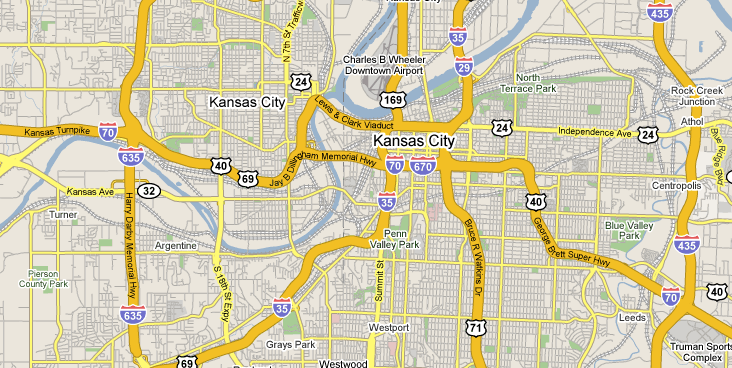 >perfect.the last shall be first.isn’t it the most humbling when people who are considered the ones in need lead the ones of upper classes to Christ?isn’t that the upside down world we’ll eventually live in?doesn’t that backwardness make perfect sense?yes.and i love maps of kansas city. >From the House of Kings comes a brilliant plan. I do think that you have to be prepared for opposition on both sides. And you must be willing to truly be a part of the community you live in, not just a “Man on a Mission”. But you are wise and know these things. The other thing you will need is prayer behind you. Call out to us, and we will pray for you, starting today.God has put some awesome ideas on your heart. Let’s see what we Manhattanites can do to send you off in style…..
>”i understand the need for service and love toward the poor and needy, but in terms of evangelism i think it’s the upper class that’s needy/farther from Jesus”maybe. a common misnomer is that everyone in the ‘hood goes to church. and yet, in the slice that i work in, 90% of the people don’t. of the 12 boys i will work with this year, exactly one goes to church. the large and populated churches in the neighborhood are mostly comprised of middle-class blacks who have since moved out to other parts of the city, but still come back to the churches their families attended. so pretty much most of the churches are catering to…errrrr… serving a demographic that isn’t really representative of the community. so when you are burdened by poverty and the churches in your own neighborhood don’t feel all that accessible to you, are you really closer to jesus? Previous Previous post: >okay. i’ll update. Next Next post: >808’s and Heartbreak.